Folks swear by elderberry benefits, which are said to include reduction of nasal congestion and swelling and the warding off of illness. But what does science say? Miriam Watkins held a small glass container up to her window. The deep purple liquid within it seemed to glow in the afternoon light streaming inside. 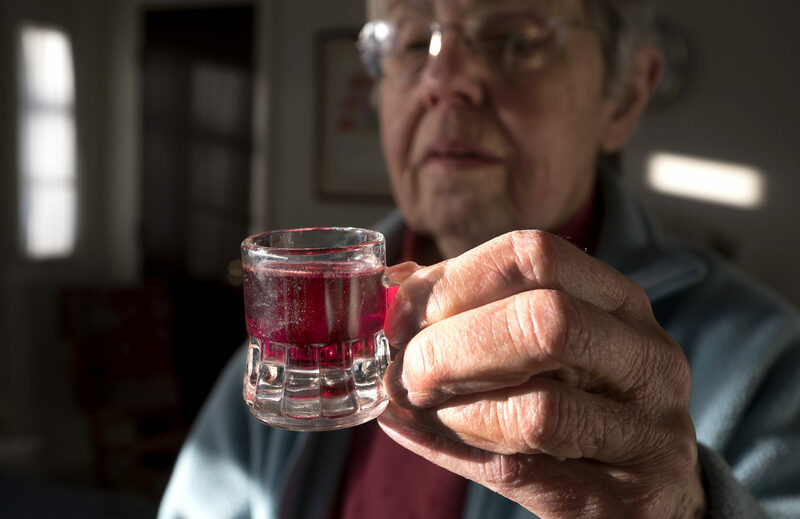 The liquid was homemade elderberry syrup, and in winter, the 86-year-old from Belfast, Maine, looks at the concoction she makes with her own elderberries and local honey as an insurance of sorts. “I drink this so I don’t get the flu,” she said this week. The science of syrups, tonics and tinctures made from elderberry fruit, of course, is not quite as cut-and-dry as that. But adherents of the age-old herbal remedy swear by it. Sambucus nigra, or European elderberry, is a large shrub that is native to Europe, Africa and parts of Asia but has become widespread in the United States. According to the University of Maryland Medical Center’s Complementary and Alternative Medicine Guide, some evidence suggests that chemicals in flowers and berries from the elder shrub may help reduce swelling in mucus membranes and help relieve nasal congestion. The guide states in no uncertain terms that children should not take elderberry products without the parent or caregiver first consulting a pediatrician. Additionally, the berries must be cooked before they are eaten because they are toxic when raw. Even without many studies, lots of Mainers do as Watkins does and make their own elderberry syrups, tonics and more. She and her adult son, Andrew Watkins, gather berries from their five shrubs, dehydrate them and then store them to use during the year. Kristin Beauchamp of Lone Spruce Farm in Dedham, Maine, also believes in the power of elderberries. The mother of three said that recently she took her younger two kids to a birthday party at an indoor playground. They had a great time, but she believes were exposed to some unwelcome germs while there. “It’s like a brightly-colored petri dish,” she said of the playground. Just a day later, her youngest was violently vomiting, followed shortly by her big brother. Meanwhile, her oldest daughter had the flu. Beauchamp needs to stay healthy — “If I go down, the ship’s going down,” she said — and so she began to take extra precautions. Thanks to the honey, the syrup is sweet (elderberries by themselves are quite tart), and Beauchamp feels that the syrup helps boost her immune system so that she won’t be felled by the illnesses her children have. She also thinks that using natural remedies such as elderberry syrup has helped her children to recover faster than they might have otherwise, a feeling that is supported by some of the scientific research into elderberries. One randomized, double-blind, placebo-controlled study done in Norway during the 1999-2000 influenza season by researchers at Hebrew University’s Hadassah Medical School in Jerusalem, showed that people who received elderberry syrup had their symptoms relieved four days earlier, on average, than those who received the placebo syrup. Another double-blind study indicated that elderberry can decrease the duration and severity of the common cold. Waldo County naturopath Dr. Elizabeth Yori uses elderberry a lot, especially in the winter. She’s the president of the Maine Association of Naturopathic Doctors and owner of Heritage Natural Health in Belfast, and she swears by the berries, saying they have antiviral qualities and contain a lot of antioxidants, which act like a fuel for the body’s own immune system to combat illnesses. Beauchamp calls elderberry one of her top three plant-based immune boosters, along with “toothache plant,” or spilanthes, and the humble dandelion, which she calls a great cleanser and tonic. Pour water into medium saucepan and add elderberries, ginger, cinnamon and cloves (do not add honey yet). Bring to a boil and then cover and reduce to a simmer for about 45 minutes to an hour, until the liquid has reduced by almost half. At that point, remove from heat and let cool enough to be handled. Mash the berries carefully using a spoon or other flat utensil. Pour through a strainer into a glass jar or bowl. Discard the elderberries and let the liquid cool to lukewarm. When it is no longer hot, add one cup of honey and stir well. When honey is well mixed into the elderberry mixture, pour the syrup into a glass jar. Store your homemade elderberry syrup in the refrigerator and take daily to help boost the immune system. This originally appeared on the Bangor Daily News’s Homestead vertical.